Our Services | Brick Fix Inc. Whether it is just a small patch job or the entire area, in just a matter of days we will make your brick work look as good as new! 1) An aluminum or plastic edging that typically comes in 8′ long sections with 10″ spikes to hold it and your bricks in place. This edging runs along the perimeter of your brick work but under the grass line. A perfect option if you are looking for something not visible and flexible around curves. In comparison this is the more economical option of the 2. 2) Basically a long concrete brick that can be up to a meter in length and significantly deeper than the bricks it is holding in place. 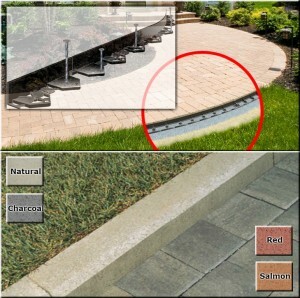 Like the aluminum/plastic edging this also runs along the perimeter of your brick work however is visible. It can’t handle curves as well, but in straight lines this is the more durable option. These restraints can either be placed flush with the brick work or left a little elevated if you like having a sort of curb. Often times the visible nature of this option is taken advantage of by choosing a contrasting colour. We put sand between the bricks joints because the particles are fine and strong when compacted together helping the bricks to properly interlock. The problem is that over time this sand gradually gets washed away and replaced with dirt allowing for weeds to grow. This weakens the integrity of the interlocking brickwork and having to mow your driveway on top of your lawn shouldn’t be necessary. Polymeric sands have been around for a number of years now, however it was probably around 7 years ago that manufacturers really started revising the formula creating a much more durable product. 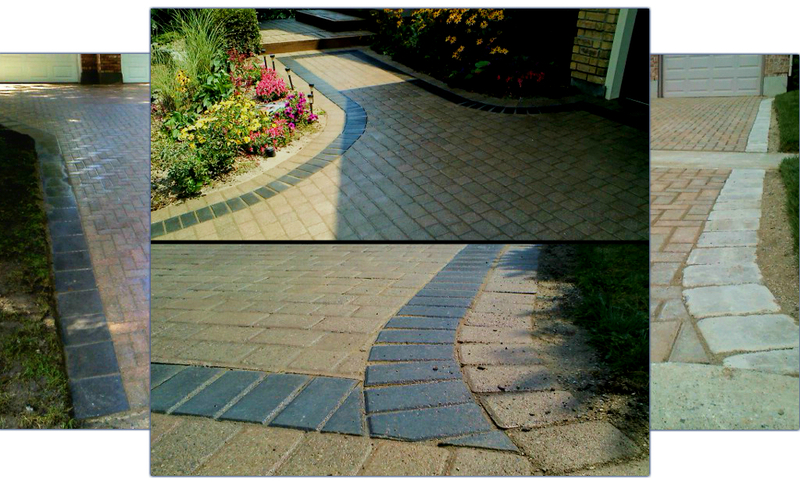 Basically polymeric sand, depending on the brand, will have chemical or organic compounds that when applied with water will help the sand adhere together and to the bricks. This will keep the sand in longer than normal sand helping your driveway last longer, and at the same time preventing weeds from growing up helping your driveway to look better and reduce maintenance. 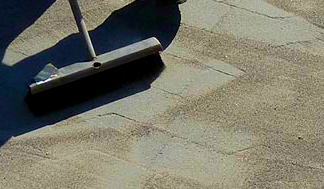 Over time, particularly in shaded areas, moss and mold may grow over the surface of your brick work. 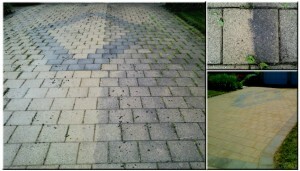 Pressure washing is done prior to any repair and will clear away the junk making the bricks look as good as new. Power washing isn’t necessary in all situations, but if not done may leave a mixed pattern of dirty bricks throughout the brick work. Reason being that the dirty bricks found under the shade may not end up in the exact same place seeing as we are dealing with thousands of bricks at a time. We are more than willing to come by and assess your brick work and offer any recommendations. In the case where sand may have washed out we can easily top that up for you. A common misconception is that when sealed, the brickwork becomes slippery. In some cases this is true, however this isn’t the fact with all brands and products. And even for those instances another product can be added to the mix to help give the sealant some grit to prevent slipping. It is recommended that reapplication occur every 2-3 years depending on the brand in order to maintain the protective layer and colour boost. The great thing about bricks is that they will probably last longer than the length of time you decide to remain at your current residence. However, maybe you are tired of looking at the same pattern and would like to “liven it up” a bit. 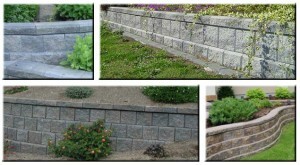 A simple solution is to switch out the perimeter with a new brick or install a new pattern in the middle. Often times we suggest a replacement brick to contrast in colour and/or finish. This option is usually a good idea especially if you don’t have any spare bricks laying around to replace any stained or broken bricks. If we are going to have to purchase replacement bricks anyways, might as well take the opportunity to customize the design the way you want it. Besides, sometimes it can be difficult to match if the specific product has been discontinued, and even if we do locate the original match, it may take a few years for the new bricks to weather. This is especially useful if you are looking to make an extension to your existing brick at the same time helping the new bricks blend in with the weathered ones. 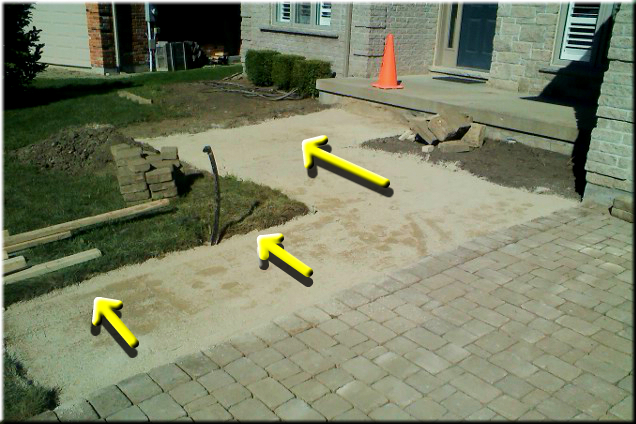 Whether your just looking to add an extra foot to the width of your driveway so that you have a bit more room to open/close doors, or whether you’re looking at adding a whole additional lane in your driveway, we can help you with that. Keep in mind the square foot rate will be a bit higher than a typical repair, but that is so that we can excavated, install a proper gravel base, and purchase new bricks. Steps make getting from one elevation to another easier and without accident, however maybe you are starting to become worried about a current step that may not be as safe as it ought to be. Maybe the step is made of wood that has rotten over the years, or that the structural foundation just isn’t there anymore. Maybe it would be better if the incline was covered over a couple steps rather than one steep step and maybe even in a series of larger landings. 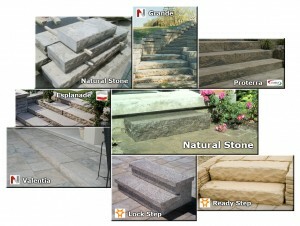 Or maybe you would like to eliminating the step altogether creating a gradual ramp. 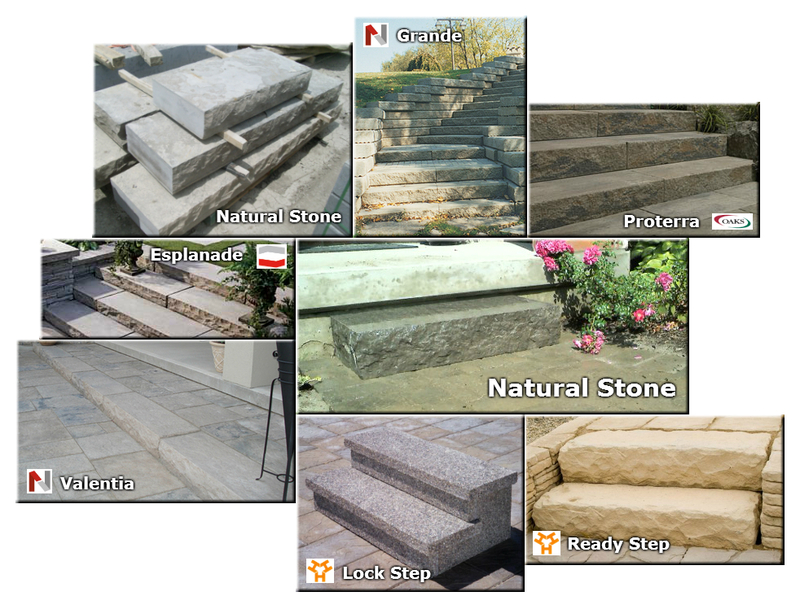 We can either repair your current step, build you a custom step that fits your needs, or replace your step with a nice natural stone step. It may be the front of the house that people see driving by, but it is the back of the house where we bring our friends and spend time with the family on those warm summer evenings. In our busy lives it can be our little oasis to escape to and relax. With so many different brick options, the possibilities are limitless for you to create you backyard of choice. Add some vertical dimensions to your property either in the front of the house for a garden or in the back for a raised patio. 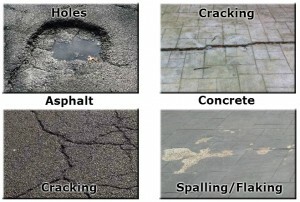 Tired of all the cracks you are getting in you asphalt or concrete? 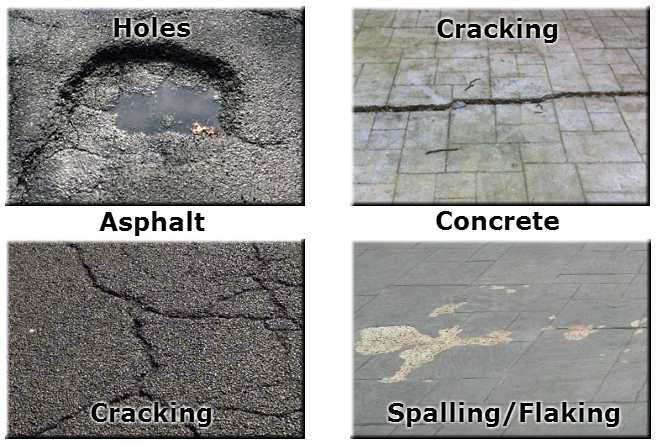 Instead of just covering up the problem by patching the low areas with more asphalt, why not switch to brick where any future repair job will look as good as new? Rather than throw out all that concrete every time you need a repair, with bricks it’s an easy fix.